• Nightmare Island: The Making of The Slayer (1080p; 52:24) is an excellent retrospective, featuring well done interviews with J.S. Cardone, William Ewing, Karen Grossman, Carol Kottenbrook, Eric Weston, Robert Short and Arledge Armenaki. 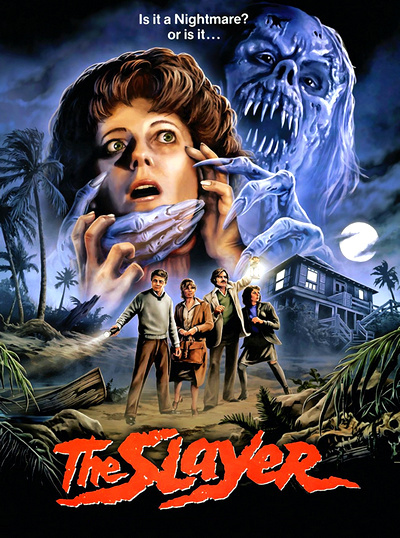 • Return to Tybee: The Locations of The Slayer (1080p; 13:18) is a fun look at some of the Tybee Island, Georgia locations utilized for the film. • The Tybee Post Theater Experience is a screening of the film before an invited audience with introductory comments (1080p; 2:38 and 1:04) and a post film Q&A session with Arledge Armanaki (1080p; 17:50) that was done in Tybee Island at the Tybee Post Theater. The Q&A is playable as a separate feature.